Glenn Beck revisited Thomas Paine’s famous pre-Revolutionary War call to action in his #1 New York Times bestseller Glenn Beck’s Common Sense. Now he brings his historical acumen and political savvy to this fresh, new interpretation of The Federalist Papers, the 18th-century collection of political essays that defined and shaped our Constitution and laid bare the “original argument” between states’ rights and big federal government—a debate as relevant and urgent today as it was at the birth of our nation. Adapting a selection of these essential essays—pseudonymously authored by the now well-documented triumvirate of Alexander Hamilton, James Madison, and John Jay—for a contemporary audience, Glenn Beck has had them reworked into “modern” English so as to be thoroughly accessible to anyone seeking a better understanding of the Founding Fathers’ intent and meaning when laying the groundwork of our government. 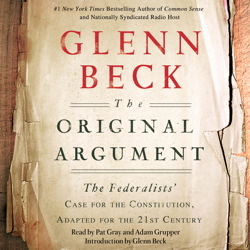 Beck provides his own illuminating commentary and annotations and, for a number of the essays, has brought together the viewpoints of both liberal and conservative historians and scholars, making this a fair and insightful perspective on the historical works that remain the primary source for interpreting Constitutional law and the rights of American citizens.